During my most recent visit to KBVU, I heard many commercial operators again using variations on the old “Any traffic in the area, please advise” phrase that has long been the bane of operations at non-towered airports. It seemed, for a while at least, that aviators had shunned that practice. 1. General. Self-announce is a procedure whereby pilots broadcast their position or intended flight activity or ground operation on the designated CTAF. This procedure is used primarily at airports which do not have an FSS on the airport. The self-announce procedure should also be used if a pilot is unable to communicate with the FSS on the designated CTAF. Pilots stating, “Traffic in the area, please advise” is not a recognized Self-Announce Position and/or Intention phrase and should not be used under any condition. The authors of the AIM rarely go out of their way to disapprove of a particular practice (short of something that conflicts with one or more regulations). That this edict was added attests to the fact that the practice had become common, wasn’t helpful, and needed to be corrected through a specific mention in the AIM. Announcing your position and intentions per the AIM and other guidance, such as ACs and the FAA training handbooks, effectively alerts other pilots to your presence. “Please advise” is redundant. Those who perceive a conflict will reply as necessary. If you are listening and looking out as you approach and operate in the traffic pattern, you’ll get the picture of what’s going on. Traffic in the area, please advise, in any form, is counter-productive noise. Next time you’re at the airport diner with several of your flying friends, try the following experiment. Assume the winds favor runway 27 at a non-towered airport. Fred, you’re on upwind. Mary, you are at midfield on downwind. Sue, you’re about to turn from base to final. Mike, you’re six miles out planning a straight-in approach. Tom, you’re 8 miles out to the southeast. And you, tuning the CTAF from 10 miles south, announce your position and ask any traffic to advise. See what happens around the table. What do you expect everyone else to say? Who decides who talks first and who follows, in what order? What do they say that they wouldn’t otherwise say as they reach one of the recommended reporting positions? What information wouldn’t you get by following the recommended procedures, completing your pre-landing checks so you can look out the window, monitoring the frequency, and making your reports as recommended in the AIM, ACs, etc.? As for the AIM being non-regulatory…see this item. Of course, none of this is intended to discourage pilots from using plain-language, common-sense phraseology to sort out confusion and potential conflicts. Even when talking directly to ATC, sometimes it’s necessary to depart from the official phrasebook to make sure everyone mutually understands what’s going on. The video below shows a series of practices I use with students in my stall/spin/upset recovery course. They fly modified barrel rolls to become familiar with all-attitude flying, to fly the airplane through its speed range, and to develop G-awareness. Next, we fly the same maneuver, but we deliberately stall the airplane at the top of the loop/roll, first in coordinated flight, then in skids and slips. These practices show the student what happens during botched maneuvers and they’re also great practice should they ever experience an upset due to wake turbulence, disorientation, or other factors. Students also learn about accelerated stalls in the vertical–the effect of abruptly increasing angle of attack, even when diving toward the ground. 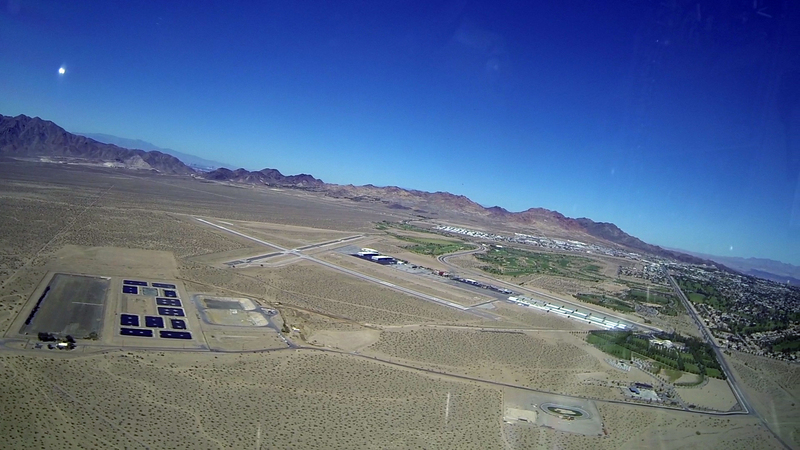 You can find more videos at my YouTube channel, BruceAirFlying. The Stalls and Spins playlist focuses on those exercises. To learn more about making aviation videos, see Aviation Video Tips. I recently created several short videos that highlight specific aerobatic maneuvers that I demonstrate during rides and instruction in the Extra 300L. Here are few; you can find more at my YouTube channel, BruceAirFlying. Like many pilots, I have long used portable GPS navigators with SiriusXM aviation weather to display NEXRAD, weather reports and forecasts, and TFRs in the cockpit. Having regularly updated (if not truly real-time) information about the weather has been a boon to safety and efficiency, making strategic decisions about weather-related diversions and other changes to the original plan for a flight much less cumbersome. The introduction of aviation apps for the iPad and other tablets and the completion of the ADS-B ground infrastructure has more pilots using the free Flight Information Service (FIS-B) products that can be integrated into products such as ForeFlight, WingX, FlyQ, and Garmin Pilot–provided you have an ADS-B receiver, such as the Stratus, Garmin GDL 39, or Dual XGPS170, among others. SiriusXM and FIS-B: What’s different? 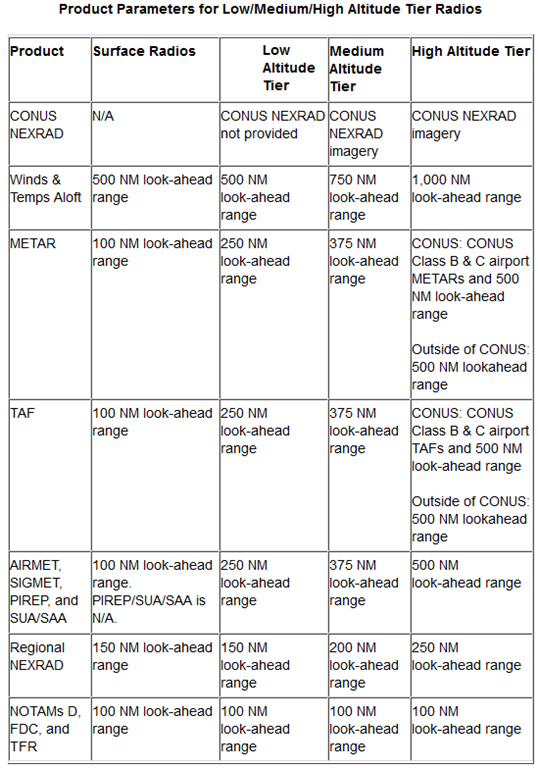 If you’re switching from the satellite-based weather and information services to FIS-B products, it’s important to understand several key differences between the information each provides, and the limitations of the FIS-B services, especially for typical general aviation pilots operating below the flight levels who want to check the weather more than 375 nm ahead. Of course, it’s also important to understand that SiriusXM information is available even on the ground, assuming the antenna has a clear view of the sky. 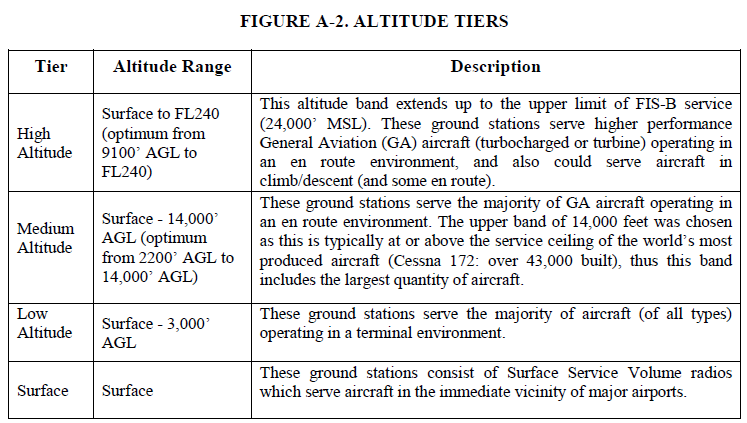 FIS-B services, based on line-of-sight transmissions from ground stations, typically are available only after you climb at least above pattern altitude; higher minimums often apply. You can view a map of and learn more about ADS-B coverage here. First, the set of weather reports and forecasts available via FIS-B doesn’t include all of the products from SiriusXM (depending on the subscription plan you choose). FIS-B also displays graphical regional and national NEXRAD composite reflectivity information. 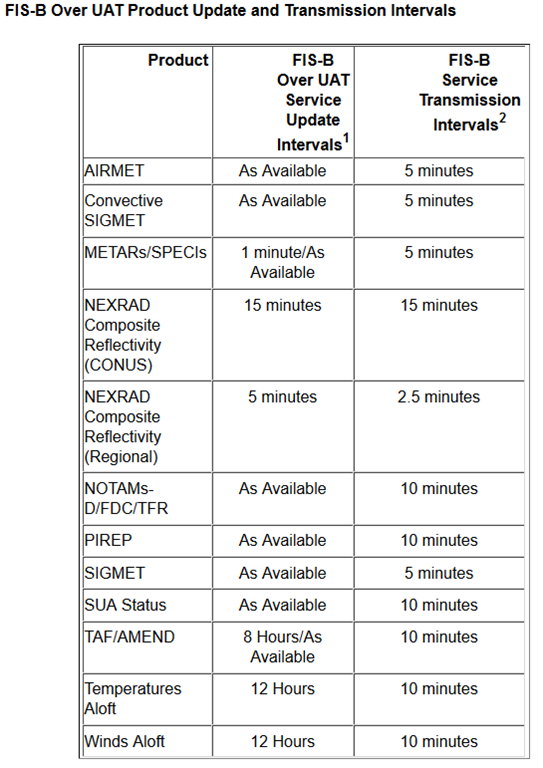 AIM Table 7-1-1 FIS-B Over UAT Product Update and Transmission Intervals shows the intervals at which fresh information is transmitted via the ADS-B network. Most of us flying normally aspirated, piston aircraft fit into the medium altitude tier, which means that some information (e.g., METARs and TAFs) is available only when the reporting airport is within 375 nm of our present position. Pilots need to consider the performance of the aircraft as well as the update rate for a specific product. For example, a pilot of a light twin aircraft, flying at a medium altitude with a tailwind could easily have a ground speed in excess of 200 knots. Thus, traveling at over 3 NM per minute, a pilot may not have enough time to receive and decipher a pop-up TFR based on the 100 NM look-ahead and a 10-minute transmission interval. AC 00-63A notes that FAA plans to add new FIS-B products in June 2018. For more information about the new products, see this item from AOPA. Lightning. Graphical representation of each lightning stroke in a past 5-minute period. Turbulence NOWcast. Two-kilometer resolution grid containing an eight-value turbulence intensity scale in each grid cell. The intensity scale depicts a weighted average turbulence for flight levels (FL) of 10,000 ft and above. Icing NOWcast. Two-kilometer resolution grids, where each grid represents one of the eight 3,000 ft ranges from FL 030 to FL 240. Within each grid, each grid cell contains the four-value icing indication and the presence or absence of Supercooled Large Drop (SLD) formation. Cloud Tops. Two-kilometer resolution grid indicating the altitude of the cloud top to an accuracy of 3,000 ft, ranging from FL 030 to FL 480. One-Minute Automated Weather Observing System (AWOS). More frequent updates of METAR-formatted information. In June 2012, NTSB released a Safety Alert about the limitations of NEXRAD displays in the cockpit. AOPA ASI offers a free online course, IFR Insights: Cockpit Weather, to help you learn more about datalink weather.